We think of a key as an instrument of openings and closings. This small object, usually made of metal, can also symbolize mystery and curiosity. The key introduced in this post isn’t used to open my car, or my house, or any door for that matter, but instead it’s used to accessorize one of my favorite outfits. Recently, I connected with Deena Saracino, who created the brand La Cle (which means Key in French). I love supporting fellow entrepreneurs and La Cle’s motto “look good, feel good, and do good with one single piece of jewelry” is a powerful phrase that speaks volumes. La Cle uses repurposed vintage keys, making each necklace unique. I chose a bronze key, not only because I love bronze jewelry but also because it signifies strength and energy. I wear this necklace every chance I get, not only because it’s a trendy piece but over time the color of your key fades, symbolizing the positive energy you absorb from the key. For me, this necklace is not just a chain with a key; it represents strength and energy that I believe is the key to happiness (no pun intended). As for the rest of my outfit, my colorful embroidered fringed kimono is from LF. I rarely shop at this store because it is just way to expensive. And though I love their unique and trendy clothes, I can’t justify spending over $200 for one item. Maybe if I win the lottery I can stock my closet with LF, but for right now the only time I shop at LF is during their yearly sidewalk sales. 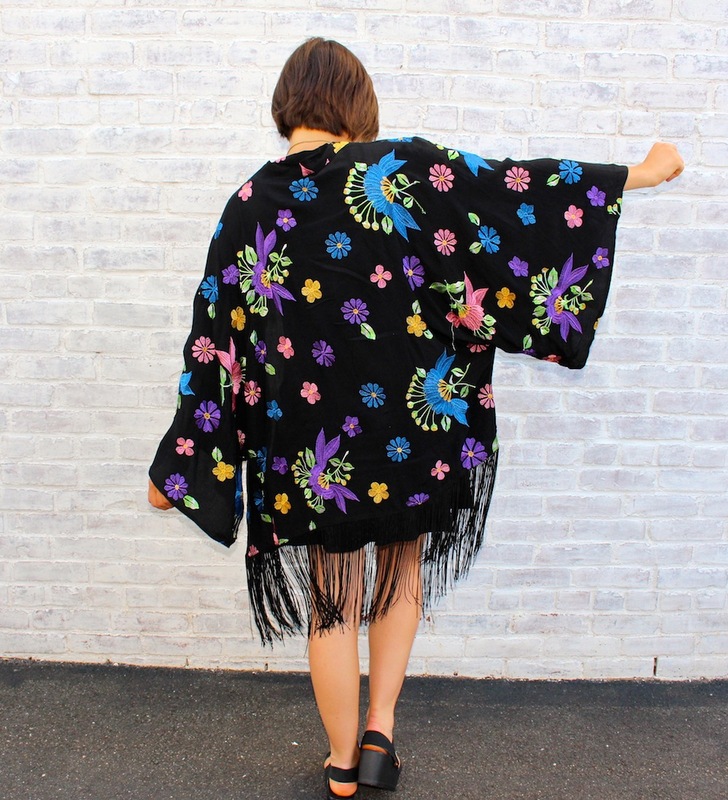 Their sidewalk sales never fail to impress with dresses, sweaters, jeans, shorts, and kimonos all under $50. This fringed number caught my eye. 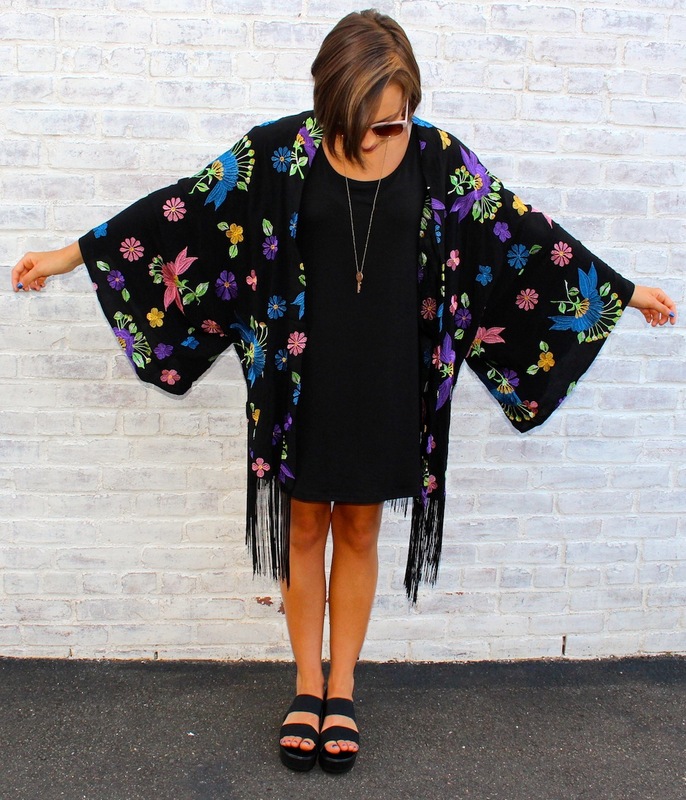 I love trying out new styles and this kimono totally channeled my inner “wild child”. 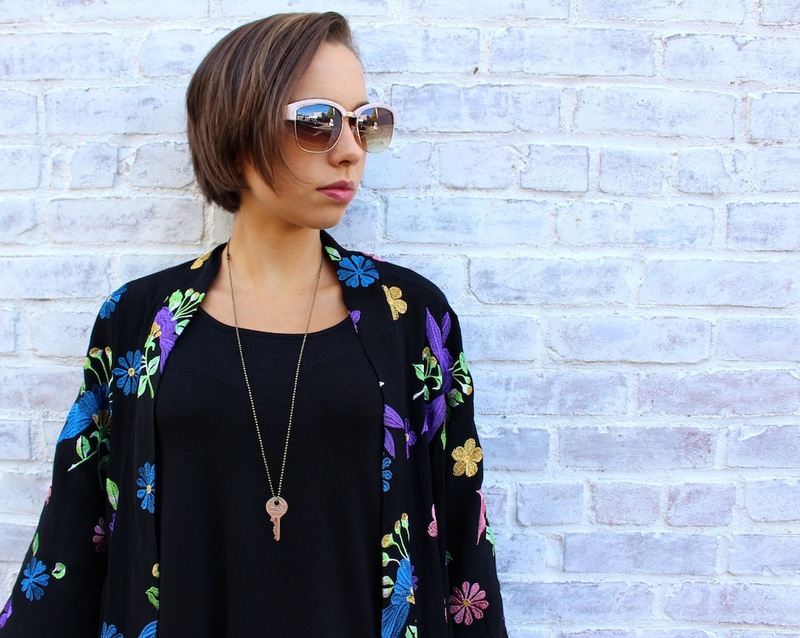 For this outfit all eyes are on my necklace and kimono. So I kept it simple with a black shift dress from Target. This dress has been getting a lot of use this summer because it’s so easy to style and looks great, especially with kimonos or statement necklaces. Finally, I found myself a pair of platform shoes. I have been eyeing a platform styled shoe for quite a while now, but didn’t want to spend big bucks on a pair of shoes I wasn’t sure if I could pull off the look. Luckily, during a recent trip to Target I found these platform inspired shoes on sale for only $12. The only good thing about the end of summer is the end of season clearance sections at most stores. These shoes totally added more of that free spirit style to my look. Since, I took these photos in the middle of the afternoon the summer sun was high in the sky, so of course I needed a pair of sunglasses. Today, I am featuring a new pair from The Loft that adds just the right pop of color. Back to the title of my post. What’s my key to happiness? For me, my key to happiness is the love and support from family and friends, my doggie Griffin, my blog, my love of fashion, and this fabulous necklace and kimono.